Wall graphics offer you a great a solution to leverage your physical environment by bringing a brand culture into it. From helping create a great first impression to onlookers (no matter whether they are your employees, customers or visitors) to strengthening your brand, such graphics can do it all and even more. 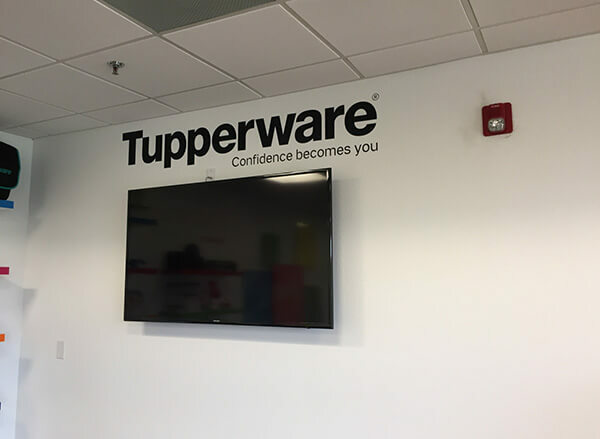 When Tupperware was opening its brand new sales training center, it wanted to make the white walls livelier with interesting and inspiring wall graphics that had a fun quotient and helped further its branding. And that’s what we at Citrus Sign Studio were entrusted to help with. 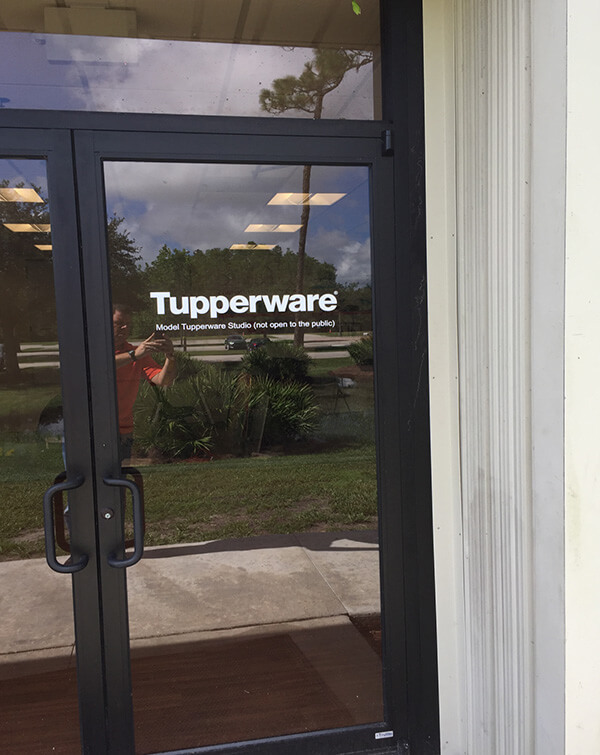 Tupperware is a renowned brand in the direct sales domain and deals with home goods and food storage solutions. When it opened its new sales training center, it wanted to transform the bare white walls that would reflect its company values and brand, and at the same time, encourage its trainees to excel. But it didn’t want it to be too serious to take all the fun out of training and learning. Rather, what the new training center needed was to make both the trainees and the instructors feel a sense of pride (for being associated with such a reputable company) and have a welcoming, fun and motivating environment to step into that would provide them with a sense of engagement. It was a multi-directional project that needed a lot of things – from logo branding and wall graphics to sales recognition walls, wall racks displaying Tupperware product and much more. Since our client brief was to use bright and fun colors that would impart the Tupperware flair to the white walls as well as the entire space, we decided to use different walls to highlight different segments. We decided to keep a section of one of the walls for depicting various levels of Vanguard recognition, with various levels depicted by V1, V2, V3 and V4 in different colors. Colorful Tupperware corkscrew-like wall graphics in red, green, yellow and purple with the fun tag of “Let’s get this part started” were created for another wall. 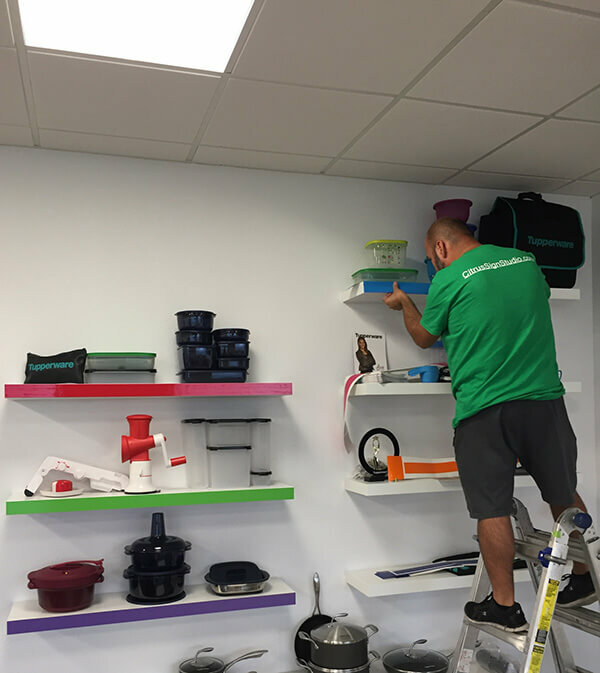 For the “Grow with Confidence” section at another end of the wall, we designed colorful wall racks where Tupperware products could be displayed and used to train the sales team handle real-life sales with confidence. 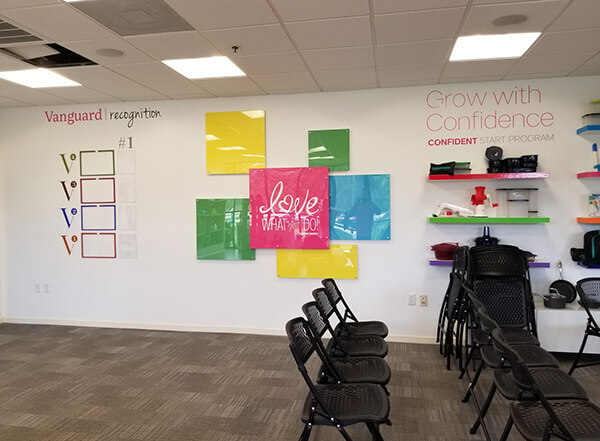 We introduced some bright, fun colors in the middle section with the central part having a lovely sign in pink that says “Love what you do” with a heart shaped “O” in the word “love” that’s sure to resonate with the trainees and keep them going strong. 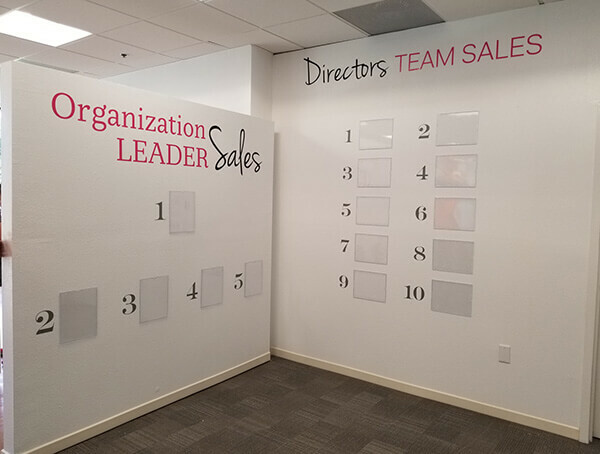 We designed two adjacent wall graphics to celebrate the high achievers – 5 spots on the Organizational Leader Sales wall and 10 for the Directors Team Sales wall. 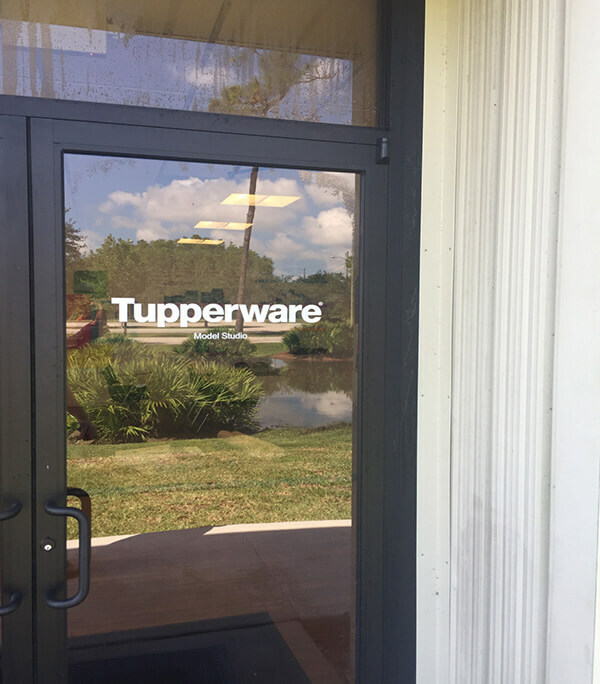 For another door, the graphics just mentioned the company’s name with “Model Studio” written underneath.Thus, we gave the walls and the entire interior space the flair and fun quotient in bright colors, which was exactly what Tupperware needed. Our expert technicians installed the wall graphics and other branding materials with utmost professionalism and in a timely manner to ensure the trainees and everyone else have a memorable experience indoors.